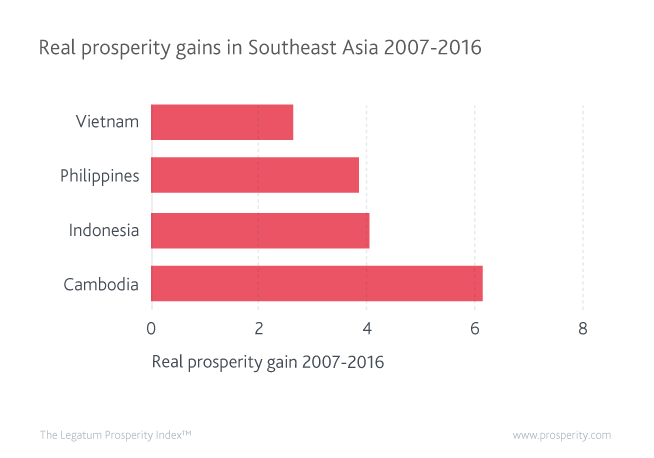 Cambodia, Indonesia, the Philippines, and Vietnam have all seen rapidly rising prosperity over the past decade. However, investment in the fundamental roots of prosperity growth in Cambodia, Indonesia, and the Philippines has seen them magnify the prosperity effects of economic growth by delivering greater prosperity with their rising wealth. Some of the biggest individual prosperity gains over the past decade have come from Asian nations as rapidly rising wealth has lifted hundreds of millions of people out of absolute poverty and towards prosperity. Wealth in Indonesia has risen by nearly 40 percent in the past ten years. Greater prosperity has accompanied it: the country has posted the third-biggest rank rise of any country in the Index. Yet, it has been more than simply rising wealth that has driven the rapidly growing prosperity of countries like Indonesia. The prosperity gains from rising wealth have been magnified by an increasing ability to turn that wealth into prosperity. Indonesia has turned a small prosperity deficit into a surplus, the surplus of the Philippines has almost doubled, and Cambodia’s small surplus has increased more than fourfold over the past decade. Investment in the structural foundations of prosperity growth have amplified the prosperity gains made from rising wealth. These countries have in common increasingly competitive economies and business environments, like many Asian countries, but crucially also greater delivery of prosperity across key structural areas like Governance, Personal Freedom, and Social Capital. Surpluses in Social Capital have been growing, as has combined performance in Governance and Personal Freedom. Investment in the structural foundations of prosperity growth have amplified the prosperity gains made from rising wealth. That is in the Philippines, Indonesia, and Cambodia. Vietnam is a different story. 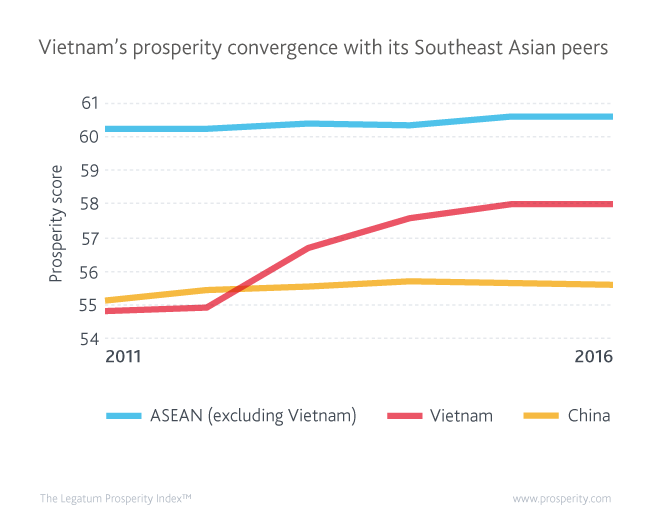 In 2007, Vietnam had the largest prosperity surplus in Southeast Asia. It was easy to see why. Walk through the streets of Ho Chi Minh City, and it was hard to imagine that war and famine once reigned here. Construction had begun on the futuristic Bitexco Financial Tower past which cars carried a new generation of Vietnamese, relentlessly chasing business opportunities rather than simply food and shelter. Vietnam has performed well since. Its embrace of a market economy and integration into global manufacturing flows have transformed it from a lesser-developed economy to a middle-income country in just a generation. What is striking about Vietnam is its recent rapid convergence with its ASEAN peers. Vietnamese prosperity has passed, and surpassed, that of China in the past five years alone. It has done so through considerable improvements in both Economic Quality and Education, where Vietnam now ranks among the world’s top 50 countries. The proportion living on under $1.90 a day has fallen from 22 percent to three percent, lifting more than ten million out of extreme poverty. The Index shows more and more Vietnamese are satisfied with their household income and living standards. In Education, more Vietnamese than ever are happy with their education system and literacy rates continue to rise. In some tests, Vietnamese students scored higher in core subjects than the average for OECD countries. Unsurprisingly, Vietnam now has the largest surplus in these two sub-indices of any country in Southeast Asia. Vietnam is getting richer, and this wealth is bringing prosperity, but Vietnam is not getting any better at turning wealth into prosperity. However, Vietnam’s overall surplus, while still high, has shrunk slightly since 2007. Vietnam no longer has the largest surplus in Southeast Asia, overtaken by Cambodia and the Philippines. Vietnam is getting richer, and this wealth is bringing prosperity, but Vietnam is not getting any better at turning wealth into prosperity. The prosperity gains from its wealth creation are stubbornly fixed. This is largely the result of a failure to invest in the structural foundations of prosperity growth. Vietnam’s rapid prosperity gains from economic progress are at risk of leaving no lasting mark. Deficits in Governance and Personal Freedom are growing. In Governance the country ranks 104th and in Personal Freedom 124th. Vietnam not only has the lowest combined score for these sub-indices in Southeast Asia, it is also the only one of its peers to see performance decline since 2007. Investment in the roots of prosperity delivery is reflected in growing prosperity dividends in Indonesia, Cambodia, and the Philippines. Vietnam’s performance is impressive, but at risk of being less resilient than that of its peers. If it is to truly take off, this resilience must be addressed. Together, Vietnam, Indonesia, the Philippines, and Cambodia have the potential to be shining stars of global prosperity. However, unless gains are rooted in prosperity’s structural foundations, future prosperity growth will be heavily dependent on growing economic wealth. Economic storms will always batter nations. Without free people, fair governance, and strong society, the resilience of prosperity in weathering the next storm is in question. Bright stars can fast be extinguished in a storm laden sky.